Is Radon gas an issue that homeowners should be concerned about? Since recent Alabama state surveys show that 2 homes in 5 have elevated radon levels, perhaps we should get more familiar with it! Radon is a radioactive gas. It is produced by the natural breakdown (radioactive decay) of uranium. You cannot see, smell or taste it, but it may be in your home, nonetheless. It is the second leading cause of cancer in the United States (behind cigarette smoke). Current state surveys show that 2 homes in 5 have elevated radon levels. 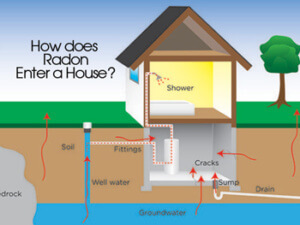 Radon enters the home through cracks in foundations or slabs, joints, underground service penetrations, untrapped floor drains, sumps, exposed soil/crawl space areas, and other openings. It can also enter a home through the water supply. It is nine times heavier than air, and thus tends to stay close to ground level. Radon levels in a home’s basement can be two to five times greater than the level of upper floors. Seal all cracks in the walls, basement floor, and joints between the concrete slab and basement walls. Cover crawl space floors and/or areas where the soil is exposed, with a polyethylene ground sheet (moisture barrier). Ensure proper crawl space ventilation. Provide tightly sealed covers for sumps or use a submersible pump. Floor drains should have water traps installed. Vent the space under the floor slab where possible. Increase your home’s ventilation rate by using a balanced, mechanical ventilation system such as a heat recovery ventilator. Unbalanced systems (exhaust only) can create negative pressure in the home and draw more outside air and radon through cracks or holes. Check with your builder to ensure that concrete walls and floors are designed to withstand soil pressures and minimize cracking. Place a polyethylene barrier under the concrete slab before it is poured. Caulk/seal all joints between the slab and the concrete walls. Avoid open air flow paths between the weeping tile and the floor drain. 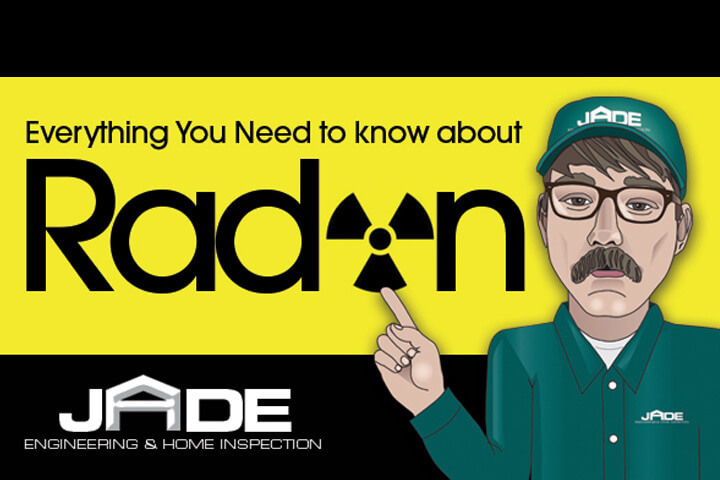 JADE Engineering and Home Inspections offers Radon Testing to its customers. Call us today at 256-318-0982 or click to contact us to set up an appointment!